We are so excited that you are interesting in volunteering with Honor Flight. 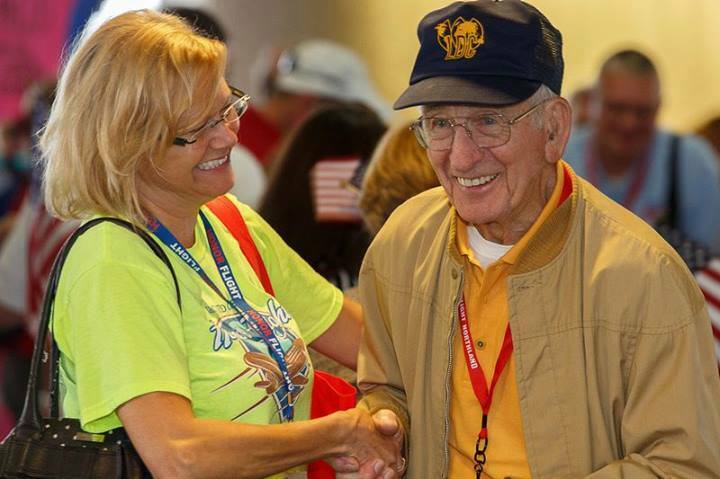 The Honor Flight Network flies veterans from 127 cities, free of charge, to visit their memorials in Washington DC. The easiest way to volunteer here is to greet our veterans as their flight arrives at the airport or their bus arrives at the WWII memorial. The flight information in our emails and on the this website contains all the information we have on any given flight. Check the Schedule and choose a flight to greet. At the airport, you may greet at the gate or outside of security. You will need to request a Gate Access Pass (GAP) at least 48 hours prior to the flight’s Estimated Time of Arrival (ETA). If GAPs are available for a flight, simply click on the “GET YOUR GATE ACCESS PASS (GAP) HERE” link. The day before the flight arrives, specific instructions on how to pick up your GAP and have your airport parking validated will be sent to you at the email address you provided when signing up for the GAP. Instructions may vary by airline. Please note that for some airlines and flights, GAPs will NOT be distributed after 30 minutes prior to the ETA of the flight. Some flights do not have GAPs available. In these cases, no “GET YOUR GATE ACCESS PASS (GAP) HERE” link is visible in the flight specs. Simply greet the veterans outside of security. You do not have to signup in advance. to greet outside of security. If no GAPs are available, you forget to sign up for GAPs in advance, or you arrive too late to pick up your GAP, please join us in greeting the Veterans ouside of security! Simply arrive by the flight ETA and stand outside of TSA security. No GAPs are needed to greet outside of security. Check the flight information for the correct terminal. Some Honor “Flights” travel by bus and go directly to the WWII Memorial. These are also included on our schedule. To greet those groups, drive or take the metro to the Memorial and gather with other volunteers outside of the Pacific Theater Pavilion, near the Visitors’ Center and Independence Avenue. 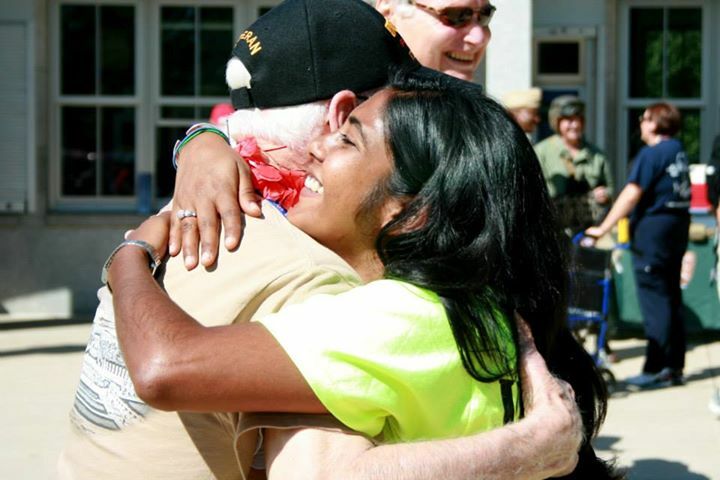 If you aren’t sure how to greet the Veterans, please check our Facebook page. Just do what the people are doing in the pictures: smile, clap, shake hands, give hugs. Or feel free to ask. Please remember, especially at the airport, that the safety and enjoyment of our Veterans is of utmost importance; we must cooperate with all airport authorities. PLEASE follow all instructions/directions from the Airline, Airport, TSA Employees, and the USO/HFDCA Team Leaders. Keep a wide walkway clear and open for the veterans and guardians to walk. Every Veteran is assigned a Guardian who is their buddy for the day. Most of the time, these Guardians accompany their Veterans from their originating city, but occasionally we get requests for DC-based guardians. All Guardians must go through Guardian Training (https://honorflightdca.com/training/). Our DCA Guardian Coordinator Laura hosts multiple training sessions throughout the season, and is also available for one-on-one trainings should our designated training sessions not fit your schedule. Please be sure to let her know if you are in the service of our military, as many hubs specifically request military personnel to accompany them. We look forward to your joining us in this incredibly heartwarming experience! I would love to help. I’m in DC. My dad was in WWII. Wonderful, Barb! We hope to see you at the airport sometime soon! Do kids need to register as well? I am a retired Marine whose lives in Northern Virginia. A friend (also a retired Marine living in Northern Virginia) and I would like to volunteer as escorts while the Honor Flight honorees are in our area. Is there a way to do that? We’d love to have you come greet our Veterans — you can find the schedule of flights on our website — honorflightdca.com/schedule! As the daughter of a WW2 Marine, sister of an Army Paratrooper and wife of a Navy vet, it would be an honor to welcome our Heros home. Would love to volunteer as a greeter..and photographer…..second generation Navy kid. What is the parking situation at national these days? Also any advice on wardrobe? Could you please send me information on being a guardian and floater? I am interested in helping in anyway needed.